Preliminary investigation findings have revealed the fire origin to be in the kitchen area of the first floor. At this time, the cause of the fire appears to be accidental. Fire investigators have concluded the majority of the on-scene data gathering. Information will continue to be collected and analyzed throughout the upcoming days. 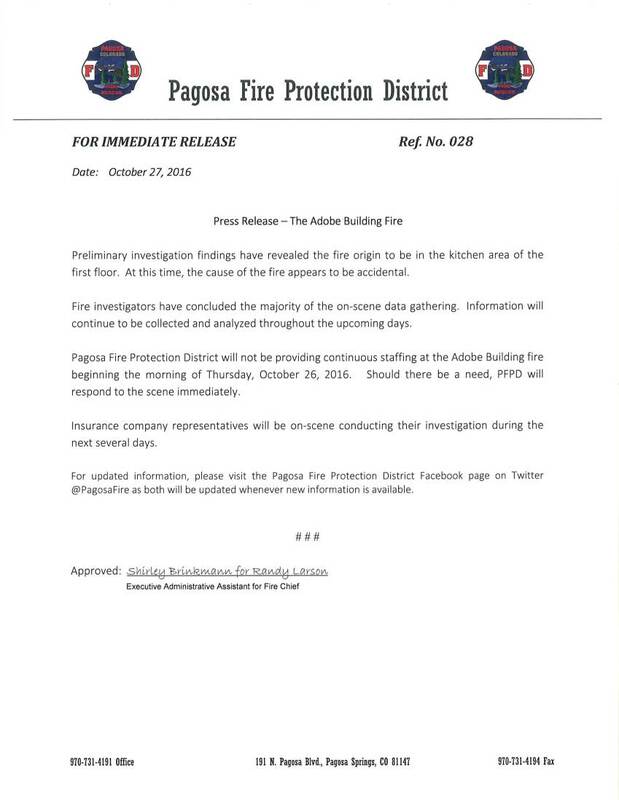 Pagosa Fire Protection District will not be providing continuous staffing at the Adobe Building fire beginning the morning of Thursday, October 26, 2016. Should there be a need, PFPD will respond to the scene immediately. Insurance company representatives will be on-scene conducting their investigation during the next several days. For updated information, please visit the Pagosa Fire Protection District Facebook page on Twitter @PagosaFire as both will be updated whenever new information is available.